Starbucks CEO meets with the men as the shop is probed for additional incidents. Starbucks said today it will close more than 8,000 company-owned stores across the nation for one afternoon to train its staff on how to avoid "racial bias" after the arrest of two black men at one of its Philadelphia shops, an incident the coffee giant's CEO called "reprehensible." The training is scheduled for the afternoon of May 29 and will be geared toward "preventing discrimination in our stores,” Starbucks said. Nearly 170,000 Starbucks employees are expected to go through the training, which will become part of the onboarding process for new workers, the company said in a statement. (Mark Makela /Reuters) Police officers monitor activity outside as protesters demonstrate inside a Center City Starbucks, where two black men were arrested, in Philadelphia, April 16, 2018. The announcement came shortly before a lawyer for the two men arrested at the Starbucks in downtown Philadelphia on Thursday addressed the media for the first time. Stewart Cohen confirmed that his clients, whom he declined to identify, met face to face with Kevin Johnson, Starbucks' chief executive officer, and "engaged in constructive discussions about this issue as well as what's happening in communities across the country." "Mr. Johnson apologized on behalf of Starbucks," Cohen said. "The conversation continues today about how this painful incident can become a vehicle for positive and social change. You have a situation and people at the center of this have come together in civility, common sense and a willingness to listen to one another and work towards a solution. Together we ask that the community respect this process." Johnson released a statement saying he and his leadership team have been in Philadelphia for the past two days "listening to the community, learning what we did wrong and the steps we need to take to fix it." 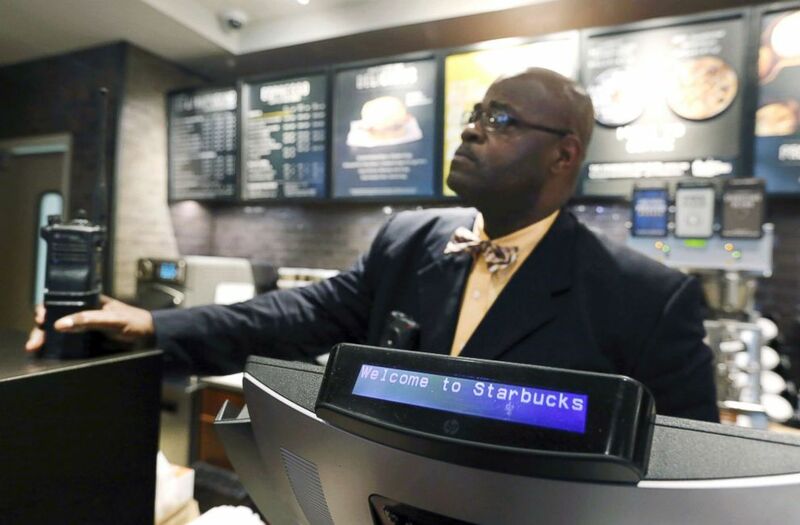 He added: "While this is not limited to Starbucks, we're committed to being a part of the solution. Closing our stores for racial bias training is just one step in a journey that requires dedication from every level of our company and partnerships in our local communities." Howard Schultz, the executive chairman of Starbucks, said in his first public comments about the controversy that his company is working to buttress its "founding values of humanity and inclusion." "We will learn from our mistakes and reaffirm our commitment to creating a safe and welcoming environment for every customer," Schultz said in a statement. Former U.S. Attorney General Eric Holder, Anti-Defamation League CEO Jonathan Greenblatt, and Sherrilyn Ifill, president and director-counsel of the NAACP League Defense and Education Fund, are among a group of leaders providing guidance to Starbucks in developing its curriculum for the training, the company said. The training will address implicit bias and how to prevent discrimination, the company said. 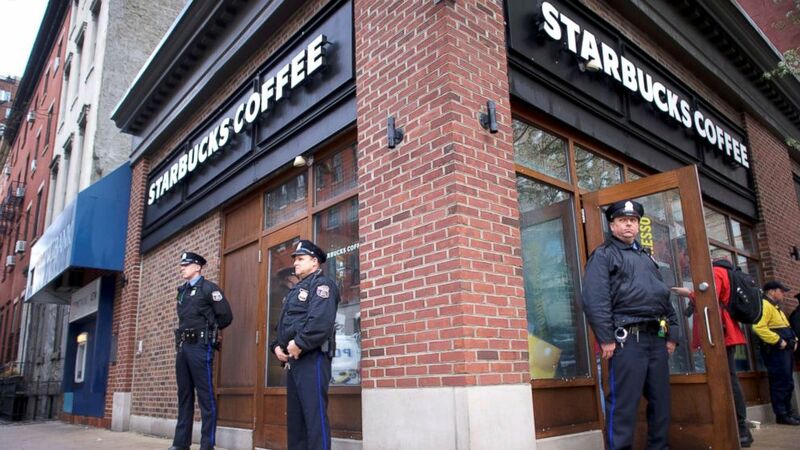 Meanwhile, the city of Philadelphia has launched an investigation into additional "informal complaints" at the downtown Starbucks shop where witnesses said the two black men were arrested for doing nothing more than sitting at a table. Philadelphia Mayor Jim Kenney said in a statement that the city's Commission on Human Relations will look into other reported instances at the Centre City-area shop. "The PCHR has received informal complaints about the specific Starbucks location since the matter arose," the commission said in a statement Tuesday. "Any information regarding these complaints are part of our current investigation, and thus are deemed confidential." Johnson met on Monday with the two men who were removed from the Starbucks after a manager called the cops to report they were trespassing and refusing requests to leave the establishment. Starbucks told ABC News on Monday that the manager, who has not been identified, no longer works for the company. In an interview with ABC News' "Good Morning America" Monday morning, Johnson said he wanted to meet the men and apologize for the "reprehensible" ordeal they went through. He said it "was completely inappropriate to engage the police" in the incident. 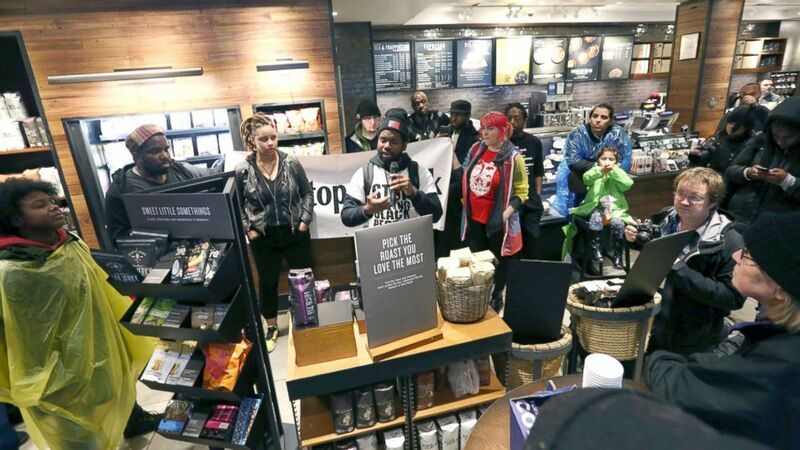 The two men at the center of the controversy have yet speak publicly about what happened to them at the Starbucks, where protesters have staged demonstrations the last two days including sit-ins inside the shop. Mayor Kenney said the city Commission on Human Relations "will be working to better understand the circumstances that led to this incident and additional reports that have come to their attention about this specific location." Neither Kenney or a spokeswoman for the Commission on Human Relations would offer details of the other incidents at the Starbucks shop in question. 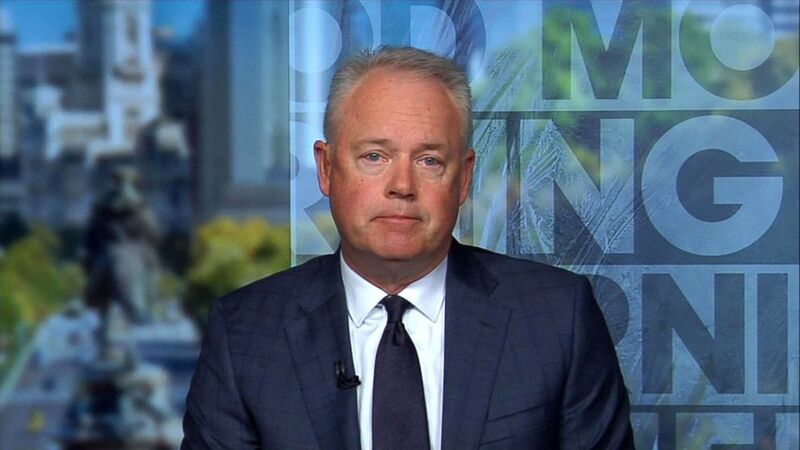 (ABC News) CEO of Starbucks, Kevin Johnson speaks to "Good Morning America," April 16, 2018. The arrests of the men were captured on video and tweeted by Melissa DePino, a 50-year-old mother of two who told ABC News she has vowed not to patronize Starbucks again. The video has since been viewed millions of times. DePino said the men were doing nothing more than sitting at a table when police officers entered the shop, put them in handcuffs and hauled them away. "It was humiliating for those guys," DePino said. "They were completely minding their own business." But Philadelphia Police Commissioner Richard Ross said officers responded to a 911 call of the men trespassing and refusing the requests from employees to leave after being told they couldn't use the restroom without buying something. Ross said the men were arrested when they refused to budge after police "politely" asked them several times to leave. "So the police get there and they are confronted by the same type of attitude and repeatedly are told that they are not leaving. In fact, there is some alleged rhetoric about 'You don't know what you're doing, you're a $45,000-a-year employee' or something to that regard," Ross said in a video statement Saturday. The men were later released after Starbucks officials refused to press charges. The Philadelphia Police Department on Tuesday said it did not have a new comment beyond Ross' video statement. Kenney, meanwhile, released an earlier statement saying the incident "appears to exemplify what racial discrimination looks like in 2018." The mayor said he met with Johnson and Rosalind Brewer, Starbucks's chief operating officer, on Monday to discuss the controversy. "I believe Starbucks will cooperate fully with our probes of the matter, particularly the Philadelphia Commission on Human Relations' review of Starbucks' policies," Kenney said in his statement. "All parties agree that the outcome of this incident was extremely unfortunate and that's why we are reviewing the incident seriously. (Jacqueline Larma/AP) A plain-clothed police officer mans a position behind the counter at the Starbucks that has become the center of protests, April 16, 2018, in Philadelphia. "This is not just a Starbucks issue. This is a societal issue. People can react differently to others based on skin color, and that is wrong. We have work to do, and we need to do so productively." He said the Commission on Human Relations will also review Starbucks' "policies, guidelines and procedures" and collect information on the demographics of the company's workforce and management. Another video surfaced Monday in which an African-American man named Brandon Ward says he was refused the code to a restroom at Southern California Starbucks because he hadn't made a purchase while a white non-paying customer was given restroom code. Ward recorded himself confronting the manager of the Starbucks in Torrance, California, and being escorted out of the business by a security guard. Ward posted the video on Facebook. "If you have a policy, you should abide by those guidelines for everyone," Ward told ABC station KABC-TV in Los Angeles. "You can't sit here and segregate things, so you might as well put on the store with your policy, 'Whites Only,' at the end." In response to this incident, Starbucks said: "Please know that we take this video and the commentary around it very seriously, and are working closely with the team to learn from our mistakes. As you may have read in the letter from our CEO, we are fully investigating our store practices and guidelines across the company. In addition to our own review we will work with outside experts and community leaders understand and adopt best practices, including unconscious bias training."